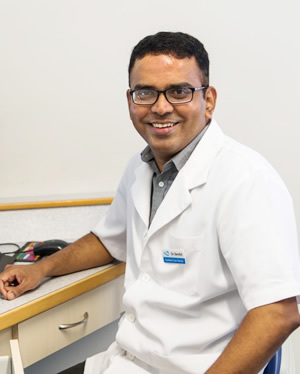 Obtaining a Bachelor of Science in Dental Surgery in India with further courses completed in implants and orthodontics, Dr Karthik took his dental exams in Sydney in 2006. He worked both there and subsequently on the Central Coast of New South Wales. Opportunity took him to Queensland, where he was fortunate to work with great mentors, state-of-the-art technology and new techniques. It was a holiday that brought Dr Karthik and his wife to Perth, and they loved it so much they decided to stay. Dr Karthik credits his mother for his career, as he grew up admiring her love of nursing. But he wanted more than what traditional medicine had to offer and decided on the dentistry path as it weaves medicine with artistry and engineering. For Dr Karthik, dentistry is the complete package. He most enjoys the feeling he gets when he sees a patient achieve a beautiful smile, or can put an end to pain and increase the quality of life. He believes oral health is a mirror of general health and reflects the person’s personality and confidence. Dr Karthik keeps up to date with monthly courses in personal and professional development, whether in Melbourne, Sydney or overseas. Self-development is one of his biggest goals, to help his dental patients feel more comfortable. Outside the practice, Dr Karthik spends time with his two young boys, loves to travel with his wife and enjoys cricket and badminton. 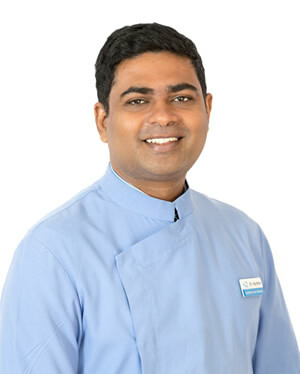 Dr Senthil graduated in 1998 from Madras Dental College, India and spent 3 years undertaking specialty training in Orthodontics at the same institute. After 8 years of practice in hospital dentistry and part-time orthodontic practice, he went on to do the TC White Training fellowship offered by the Prestigious Royal College of Physicians and Surgeons of Glasgow in 2008. Since then he has been a member of the Royal College of Physicians and Surgeons of Glasgow. Additionally, he has 5 years and 2 years of general dental practice experience in New Zealand and Australia respectively. He regularly attends lectures and courses to update his knowledge in order to provide the best dental treatment to his patients and is passionate about bringing out an aesthetic and healthy smile in all of them. Dr Senthil is happily married with a daughter and a son. He enjoys computers, jogging and south Indian cooking. Our dentists are passionate about what they do. For high-quality, compassionate dentistry, contact us today and find out how we can help you achieve a brilliant smile!